The collapse of three great European dynasties: the Romanovs, the Habsburgs, and the Hohenzollerns. The story of British Prime Minister Sir Winston Churchill, focusing on his place in British life just prior to World War II. The Royal Shakespeare Company's 1974 production of William Shakespeare's Antony and Cleopatra, though a slightly truncated version, stands out among Shakespeare interpretations on film for the quality of the direction and the convincing nature of the performances that bring the main protagonists to life as three-dimensional human beings. 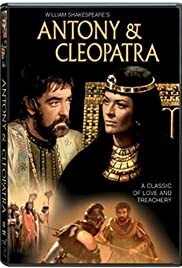 Produced by Trevor Nunn and directed by Jon Scofield, the film stars Richard Johnson as the full-bearded Roman statesman/warrior Mark Antony and Janet Suzman as the voluptuous Egyptian Queen Cleopatra whose seductive allure may have changed world history. Though filmed entirely in a TV studio with extensive use of close-ups, the RSC interpretation is a riveting and involving experience, especially in contrast to the vastly inferior BBC performance of 1981 (I have not seen the Charlton Heston version recently reviewed here). There is no commonly accepted date of publication for Antony and Cleopatra, although most orthodox historians favor the date of 1607 since it was first entered with the Stationers' Register in 1608. There is, however, no compelling evidence to support that date. The play was not performed until at least 1607, perhaps because Cleopatra, the ruler of Egypt, bore striking resemblance to Queen Elizabeth I who died in 1603. Cleopatra, according to Dr. Ren Draya of Blackburn College calls Cleopatra "larger than life", a woman who cannot be explained but can only be felt. "She is a woman who stands for power but at the end gains lyricism and achieves nobility." Indeed, according to one reviewer, "Antony and Cleopatra is an unusual tragedy in that its protagonists start out flawed and gradually grow to heroic stature over the course of the play." According to Professor Michael Delahoyde of Washington State University, Cleopatra is suggestive of Queen Elizabeth 1, a "drama queen" who used her feminine wiles to gain political advantage. Perhaps that is the reason why the play was not performed until after the Queen's death, if indeed it had been written prior to that event. Shakespeare is mostly faithful to his source material, Plutarch's Lives, though he concentrates on the relationship between Anthony and Cleopatra and ignores some of the historical events reported by Plutarch. Antony alone is a tragic hero in the Plutarch chronicles but, in Shakespeare, Cleopatra is invested with an equally tragic character and soul-searching introspection, delivering eloquent soliloquies that can be compared to those of the most powerful Shakespearean male protagonists. Shakespeare makes no moral judgment at all on either of the main characters and allows the audience the freedom to become emotionally invested in the drama without being spoon fed the prevalent Puritan morality as in the high moral tone of Mary Sidney Herbert's free translation of Garnier's Antoine, published in 1590. The story revolves around Antony's decision to provide free rein to his impulses by courting the Queen of Egypt rather than carrying out his soldierly duties in Rome and the consequences of such. Antony, who was one of the ruling triumvirates of Rome along with Octavius known as Augustus Ceasar (Corin Redgrave) and Lepidus (Raymond Westwell), is summoned back to Rome where he makes a deal with Ceasar to marry his widowed sister Octavia (Mary Rutherford) and return to fight Rome's battles against the aggressive Pompey. Not willing to give up his Egyptian connection, however, Antony unleashes a civil war against Ceasar but is defeated at Actium after many of his trusted men including his close friend Enobarbus (Patrick Stewart) desert him and his reputation begins to decline sharply. Meanwhile, Cleopatra is torn between saving her life and protecting her children by supporting Caesar or remaining loyal to the defeated Antony. Both unfortunately meet a tragic end that can only be called "Shakespearean" in its noble grandeur.